I went through more than thirty years of domestic abuse. God has let me live to write my story. I now use that story in working with abused women. I have also written a sequel that is being edited. If I leave him, where will I go? What about money? what about my kids? To let you know a little of the background for "I Got Flowers Today"
A friend of mine was in an abusive marriage. In Oct of '91, I wrote the poem 'I got flowers' for/to her. Her husband was about six feet tall, she was 5' 2" and blind. she couldn't even see the blows coming when it did. her to find the strength to get out of that situation. She is now well alive and my wife. Domestic abuse is a terrible thing. have been killed since 1989.
the silence of domestic abuse, for each lady. In 1999 (20) were killed. to be killed, most of them beat to death. Is heaven in the yellow part, I don't know where to look. I hear him call her name sometimes, but I really don't know why. She's been gone a long, long time she needs to come home now! I really need to reach her, but I simply don't know how. Help me find the number please, is it listed under "Heaven"? I can't read these big big words, I am only seven. Mommy said when we need help that's where we should go. Thank you operator, I'll give them a call. to become informed about abuse of another kind. to those yet to become victim. and its tears will end. I'd like you to take a moment to read the link below. With our help....we can Find this mother and daughter. What Happened to Grace and Little Gracie ? Reward for information leading to Michael Reapp's whereabouts. A notice on Grace's page right under Michael's photo will explain this. for further questioning by the Vermont State Police. is in the hearts and minds of so many. 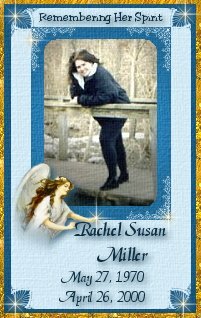 Please come light a candle for Rachel. 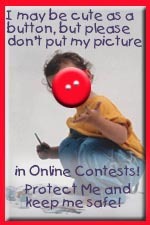 If you would like to link to this site, please take my banner. My book is in print in the United Kingdom, today (April 2, 2001) is the first say it has been displayed. Any one of you that has a website and is not yet linked to me (this is a complete new website) please let me or my webmaster know. Any one that would like to display my book on their website just get in touch with me. If any of your friends would liked to be linked to me, please let them know, I will be most grateful. It is a story that needs to be told. Not because I wrote it, but because it is a true story and is helping people. That's the key to my heart. Being able to help others. 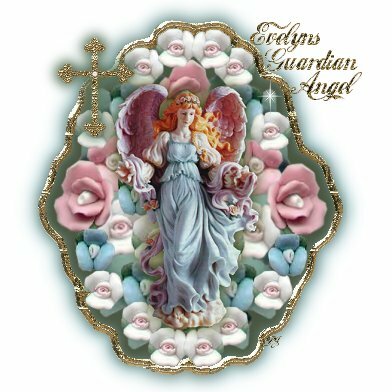 I made this Guardian Angel for you to use as you please..
Hope you like it as much as I enjoyed making it..
All HTML was hand coded. No HTML editors were used.